Par M.Bonne, Ingenieur-Hydrographe de la Marine.. Copper engraving uncoloured as issued. Overall sheet size 46.4cms.x 31.6cms. Image size : 342mm.x 241mm including imprint ;3 scales of distance. Centrefold as issued. Very good condition apart from two repaired wormholes in border below neatline at top of map either side of the centrefold. Two archival repairs on verso: one to thinning at top margin and one repairin small wormholes bottom margin - both well away from printed area. An attrative map of ancient Spain and Portugal with the Balearic islands Majorca, Minorca etc As Royal Hydrographer, Bonne's main concern was the production of marine charts but he was also involved in other works. 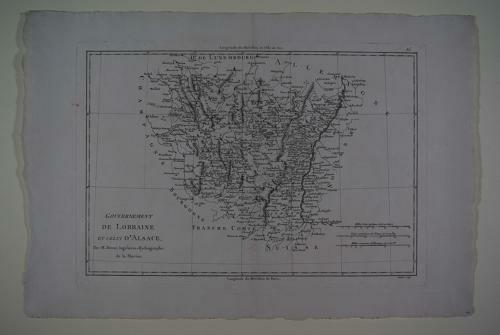 He supplied maps for an atlas by Guillaume Raynal and for an Historical Atlas and Encyclopedia which was published in association woth Nicholas Desmaret.